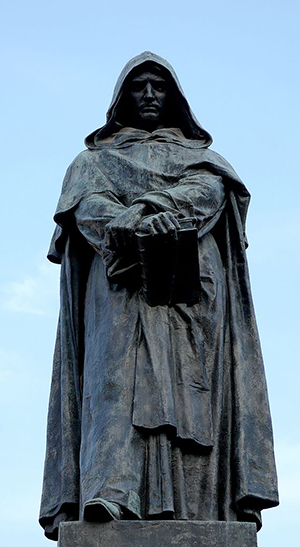 Giordano Bruno (1548 – 1600) didn’t do himself any favours. Not only did he adhere to a set of particularly extraordinary heresies but he also didn’t know when to shut up. Unlike his predecessor Copernicus who was happy to claim that his model of the universe was a mere mathematical convenience, rather than a description of reality, Bruno wandered around Europe shouting out his contentious beliefs to all and sundry and generally being obnoxious and argumentative. He was a bit like a drunken mate in a pub who when asked to keep it down merely bellows his off-colour remarks all the louder. Bruno argued that the universe was infinite and filled with stars like our own sun. These had their own orbiting worlds populated by sentient beings and when anything in this limitless manifestation of the divine soul died it was reincarnated. To a beleaguered church battling against the rise of Protestantism and trying to get its head around the idea that the earth might go round the sun instead of vice versa this was turning the heresy knob all the way up to 11 and so they burned Giordano Bruno at the stake in 1600. In the history of science Bruno is generally regarded as a brief diversion away from the more sensible post-Copernican tradition of Galileo, Kepler, Descartes and Newton. His beliefs were too deeply embedded in the alchemical tradition and he spent a lot of his time developing the Memory Systems of classical antiquity into a mystical schema to unify man’s mind with creation. It’s a commonly held myth that the Vatican was firmly entrenched against the new astronomy. 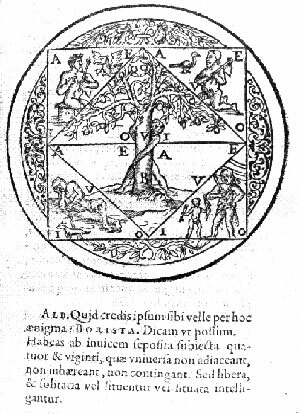 The objections to a heliocentric model were mathematical rather than spiritual. Sending the planets around the sun in perfectly circular orbits is as inaccurate as the old Ptolemaic model – it was only when Kepler realised they follow elliptical paths that the sums fell into place and mirrored what observers saw through their telescopes. What really exercised the authorities was the debate around transubstantiation (i.e. the belief that bread could change its substance and become flesh) because a challenge to that was an attack on the Mass, which was the cornerstone of the Catholic faith. The cardinals quite rightly didn’t care what was going on through Galileo’s telescope, they were more agitated about his theories about the properties of matter. Similar attacks on the idea of the Trinity and the soul had the Inquisition out in force. Bruno’s suggestion that the entire universe was the soul of God and therefore we were all part of the eternal spirit sounded suspiciously Protestant. That and a tendency to make needless enemies by generally being obnoxious made his trip to the stake inevitable. 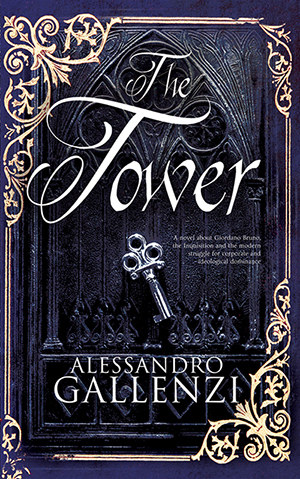 Bruno’s link with the Hermetical Tradition and the Memory Palaces of antiquity form the core of Alessandro Gallenzi’s tightly plotted thriller The Tower (Alma Books, 2014). The novel switches between the late sixteenth century, following the peripatetic career of Bruno himself, and the near-future Middle East where a Google-esque multinational is building a huge tower in the Jordanian desert to house the digitized archive of all the world’s books and manuscripts. The modern-day hero, a rather dozy investigator called Peter, teams up with the enigmatic Italian literary scholar Giulia to track down a stolen manuscript. The suspicious death of a Jesuit priest sent by the Vatican suggests that the document is another explosive tome ready to rock the foundations of the church. At the same time the tower itself becomes the target of anti-technology guerrillas and Islamic fundamentalists who see its quest for corporate dominance as an impious rerun of the tale of Nimrod, and who are also after the mysterious manuscript. Gallenzi’s portrayal of Bruno and his travels through late Renaissance Europe is superb, not only throwing light on the poorly documented chronicle of his life but also providing a great deal of sympathetic insight into the man’s thought processes. The author portrays the philosopher as a visionary committed to his pursuit of divine transcendence to an obsessive and obstinate degree. His unbending commitment to his goal – to create a memory system that will reveal the true nature of reality and allow the human spirit to be absorbed into the universal all – leads him to discount his friends and majorly hack off his enemies. In the end his downfall is less the result of his rather obscure heresies and more the direct result of personal animosity. Gallenzi really gets under the man’s skin and you can’t help but feel sorry for him as he realises that ignoring your enemies and disregarding your friends speeds up the inevitable. The modern-day story is less assured. It manages to ratchet up the tension with a convincing plot, set against a terrific Babel-esque backdrop, but the characterisation is a pale shadow of the finely realised portrait of Bruno himself. Despite being an investigator the hero, Peter, falls into situations rather than tracking them down and he oscillates between confused, drunk and scared. His companion, the enigmatic Giulia, has potential and is a fun counterpart to Peter’s general uselessness, but neither she nor their odd-couple relationship is fully realised and all the really interesting action seems to happen off-screen (murder, assault on the tower etc.). There are some very clever and entertaining set pieces – navigating through the Tower during a power cut, getting through Israeli customs – but ultimately it feels like the suggestion of a very cool hi-tech thriller rather than the story itself. For anyone interested in Giordano Bruno and his relationship to the Church and the Hermetical Tradition, The Tower is a must-read, primarily for its brilliantly evocative portrait of the man, his times and his arcane philosophy. The modern Tower of Babel story is also enjoyable, if sketchy, but has enough entertaining scenes to keep the attention. You can get The Tower from Amazon UK here and from Amazon US here. and Francis Yates’ classic The Art of Memory. Thank you for the thoughts, I need to read full version of this novel… but I can not find a way to buy it online as pdf format. Could you please help how I can buy it? 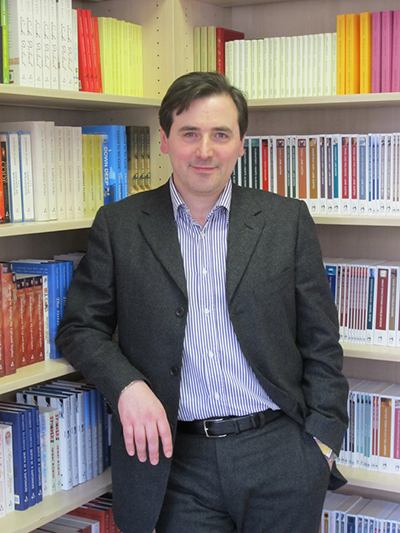 As far as I know the book is only available in physical copy and kindle version – both quite expensive, I’m afraid.